Board And Batten Siding, Classic Look In Long Lasting, Low Maintenance Vinyl. Board and Batten or 'Vertical' siding has been around for hundreds of years. It is still one of the most popular home siding styles used today. It adds rustic beauty to homes and is often used in conjunction with other types of siding such as Cedar Shake and or Clapboard. Vertical siding is siding that runs up and down, or vertically. From top to bottom. This is a style of siding where 10" to 12"+ wide long cedar boards are nailed vertically from top to bottom of the house. The widths of the boards come in many different sizes. A small batten, usually one or two inches wide is nailed where the two wooden planks come together in order to seal the crack at the joint between the boards. This 'batten' sealed the cracks between the boards and made early homes more weather tight and helped keep out the cold winter winds, making the home much warmer in the winter time. Hence the term 'Board and Batten'. Look around your neighborhood and you will see it everywhere. It recreates the historic charm and rustic look of centuries old cedar plank siding. It is often used with cedar shake or other types of siding to add more contrast to the home. 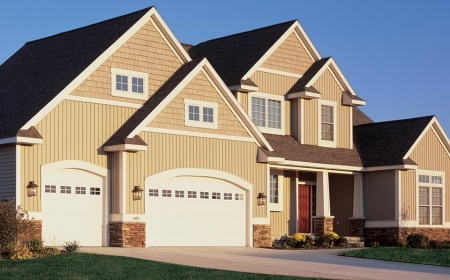 Today vinyl siding recreates the look of long cedar boards hung vertically. It looks just like real wood and never needs painting, will not rot and termites will not eat it. All for about half the cost of real wood. It can be installed over most existing outside walls. Rugged outdoor charm that makes a strong statement on your house. It gives homes that look that only real cedar wood used to do. Here the siding is used here as an accent on the ends of the house in conjunction with clapboard and vinyl cedar shakes. A 10" board with a 2" batten to create an 12" wide board, or profile. 5/8" custom contoured foam provides extra strength, rigidity and increased R-value. 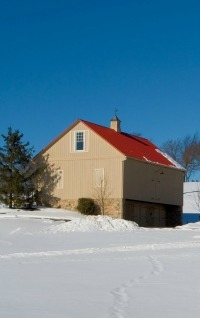 Here used on the garage gable and the end of the house on the right. Cedar Shake Siding is used on the main house and natural stone used as accent. Very nice look, charming and rustic. Good use of multiple siding types working together. Used here with 'Scollops' to create a special look on the house. Cost is very similar to what the other types of vinyl siding cost. Somewhere between $3 and $10 per square foot depending upon what quality or thickness you choose and whether it is insulated or non-insulated. 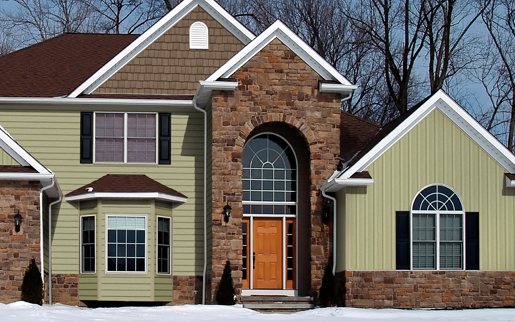 Vinyl siding like all products comes in several different levels of quality. Higher grades will cost more than economy brands. If you have a 2,000 square foot house and want to install new siding you would just pick the price point that fits your budget. Vinyl siding comes in many different price ranges, ask your contractor for his opinion once you have decided on your budget. He may be able to point you to specific products to save you some money. 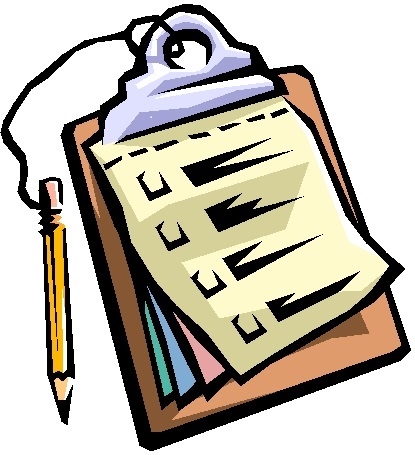 To get more information on how to make yourself a realistic budget... click here. If you like this type of siding for your house, tell your contractor. Once you have picked out some products, colors, textures and most importantly, thickness, then ask your contractor for his opinion. Remember he is a professional and installs vinyl siding every day and will be glad to answer your questions. And he may have suggestions on different products that could save you some money! Vertical siding has been around for a long time. Vertical siding has its roots in early colonial America where it was use on barns through out early America and is sometimes still called 'Barn Siding'. 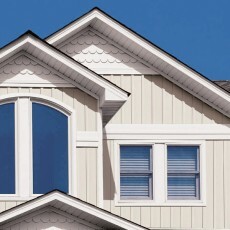 Still used today, it is one of the most popular siding types. More more history click here..continue reading . Here the siding is used on the front of the garage to add style. Notice how they used it with cedar shake siding to create a different but very modern look. 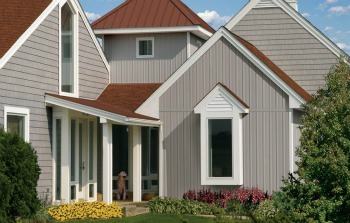 Shown here is CertainTeed vinyl siding. 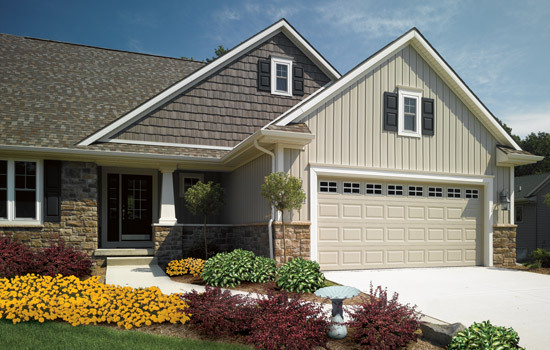 See how the siding is used with clapboard siding to create a particular look. Here they use an 6 1/2" board with a 1 1/2" batten to create an 8" wide board. This time tested old colonial style is very much alive and doing well today. 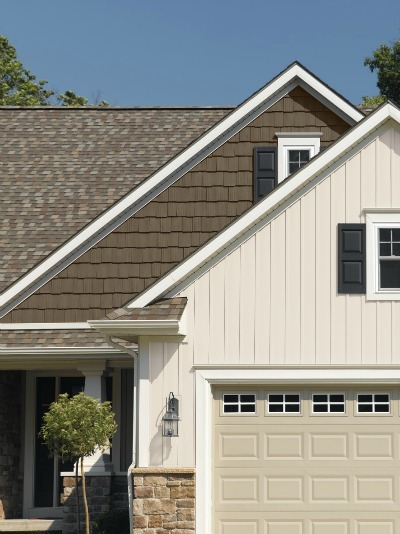 To see more information on CertainTeed Vinyl Siding Products: Click here . To see more pictures,Click here.. more pictures. Comes in many different colors. The CedarBoards collection by CertainTeed has 13 low-gloss colors. 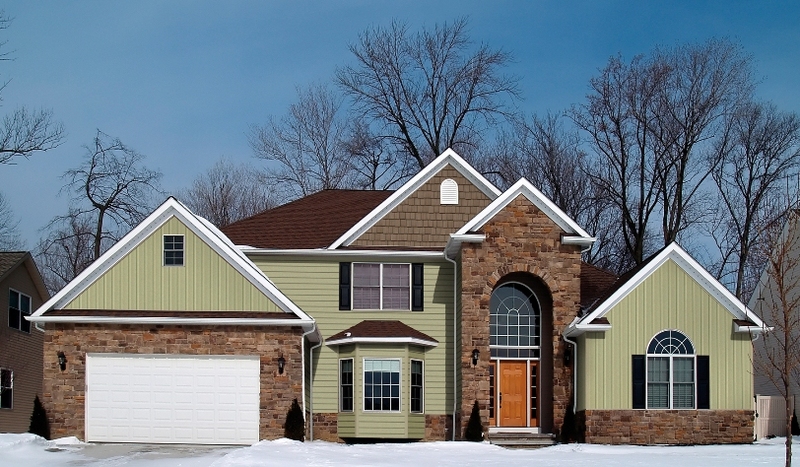 To see more information on CertainTeed vinyl siding products... click here. Used here on the garage front and homeowner has used Cedar Shake Siding on house gable. Note the different colors of siding used. Here used with scollop siding. Scollop or half rounds make a wonderful accent to a home.